As promised, here are the knitting quotes from Little Women. They are taken from the Kindle edition, which also contains Good Wives in the same volume. It’s bad enough to be a girl, anyway, when I like boy’s games and work and manners! I can’t get over my disappointment in not being a boy. And it’s worse than ever now, for I’m dying to go and fight with Papa. And I can only stay home and knit, like a poky old woman!” And Jo shook the blue army sock till the needles rattled like castanets, and her ball bounded across the room. 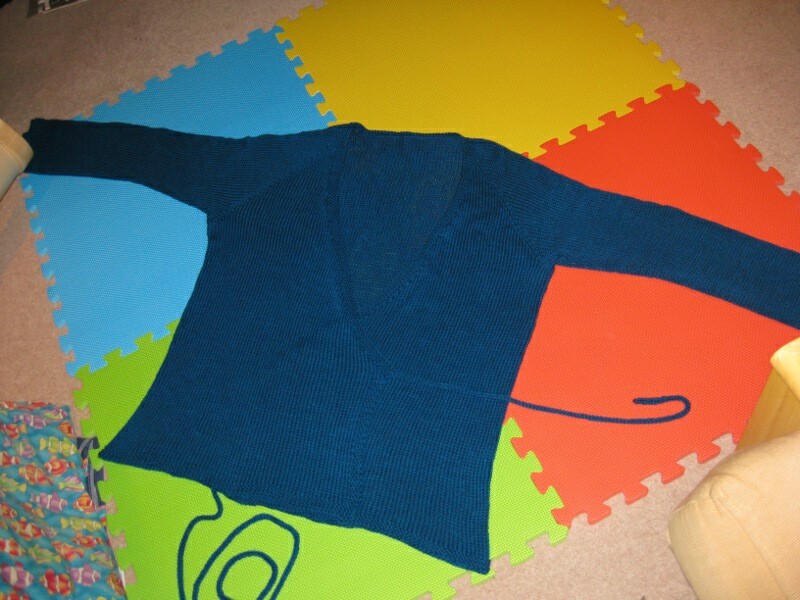 Knitting is used here as a way of establishing Jo’s character. Disappointing use of the knitting is for old women stereotype. What a contrast between Beth and Jo. Is knitting with all ones might more effective, I wonder? “Then you may come, and I’ll teach you to knit as the Scotchmen do. There’s a demand for socks just now,” added Jo, waving hers like a big blue worsted banner as they parted at the gate. I wonder what ‘worsted’ means in this context. Can it mean the weight of yarn, as used currently? Seems unlikely for socks, since they would be rather bulky and impractical for Army use. Maybe it is referring to the spinning method. Any ideas? But Jo had her own eyes to take care of, and feeling that they could not be trusted, she prudently kept them on the little sock she was knitting, like a model maiden aunt. A stealthy glance now and then refreshed her like sips of fresh water after a dusty walk, for the sidelong peeps showed her several propitious omens. Mr. Bhaer’s face had lost the absent-minded expression, and looked all alive with interest in the present moment, actually young and handsome, she thought, forgetting to compare him with Laurie, as she usually did strange men, to their great detriment. Then he seemed quite inspired, though the burial customs of the ancients, to which the conversation had strayed, might not be considered an exhilarating topic. Jo quite glowed with triumph when Teddy got quenched in an argument, and thought to herself, as she watched her father’s absorbed face, “How he would enjoy having such a man as my Professor to talk with every day!” Lastly, Mr. Bhaer was dressed in a new suit of black, which made him look more like a gentleman than ever. His bushy hair had been cut and smoothly brushed, but didn’t stay in order long, for in exciting moments, he rumpled it up in the droll way he used to do, and Jo liked it rampantly erect better than flat, because she thought it gave his fine forehead a Jove-like aspect. Poor Jo, how she did glorify that plain man, as she sat knitting away so quietly, yet letting nothing escape her, not even the fact that Mr. Bhaer actually had gold sleeve-buttons in his immaculate wristbands. “Dear old fellow! He couldn’t have got himself up with more care if he’d been going a-wooing,” said Jo to herself, and then a sudden thought born of the words made her blush so dreadfully that she had to drop her ball, and go down after it to hide her face. The maneuver did not succeed as well as she expected, however, for though just in the act of setting fire to a funeral pyre, the Professor dropped his torch, metaphorically speaking, and made a dive after the little blue ball. What a contrast in Jo’s attitude from the beginning of the book. Love the idea of knitting being used to hide inconvenient facial expressions. Similar to the trick of bending down to pick up a pen to avoid falling asleep during boring lectures. In other news: the cardigan is still not dry. Maybe I shouldn’t have wet it quite so thoroughly. I’ve already mentioned that the Neckdown Wrap Cardigan is my first adult-sized cardigan. I expected that there would be a fairly steep learning curve, but didn’t realise quite how that would manifest itself. Some people read instructions, others prefer to wing it. Some people treat instructions as a prescriptive method to follow, for others they are mere guidelines to be interpreted or ignored according to whimsy. When it comes to knitting, I read instructions, and almost invariably follow them slavishly. When I started knitting this cardigan I read the instructions, bought the two extra sets of dpns that I would need and went through the pattern circling all the numbers applicable to my size. I also highlighted a couple of other instructions that I thought I might miss. I know. Sorry about that. 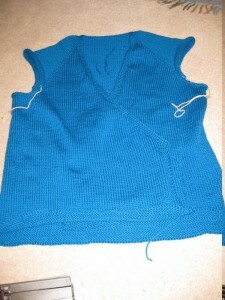 Yesterday I picked up, as planned, the 214 stitches for the neckband and merrily knit the two garter ridges. 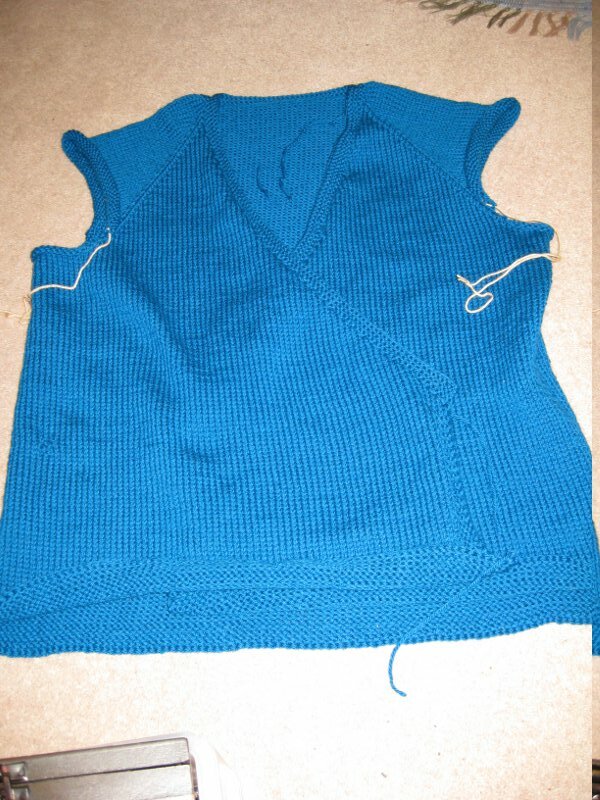 As I put the knitting away at the end of the evening I was happy in the knowledge that this morning I only needed to cast off the stitches and the neckband would be done. When I got it out this morning, the neckband looked a bit rubbish. I checked the pattern numbers. Yes, I had picked up the right number of stitches, I had knit the correct number of rows. Just one small problem – I had ignored the instruction (clearly circled in the pattern by me) ‘using the smaller needles’. On a not un-related subject, today I have been inserting a lifeline, ripping 4 rows back and re-knitting. It looks much better now, particularly since I made the neckband a bit wider as in the photo on the pattern. In the next exciting instalment: sleeves. The urge to knit is surely the most moral force in the world. Knitting is industrious, economical, virtuous, therapeutic, mildly creative and above all tranquillising. Research would show that knitting wives never become nervous wrecks and that it is never knitting girls who break up happy homes. Conversely it would be found that the Other Woman never knits. How times change. For me knitting is leisurely, expensive and slightly indulgent rather than industrious, economical and virtuous. I would agree with it being therapeutic and creative. Tranquillising is an interesting word to use and perhaps there is a grain of truth in it, but I don’t really like it. Perhaps soothing and relaxing is a better way to put it, although not when figuring out where a lace pattern has gone wrong or doing rows of twisted rib or trying to p2togtbl. Anyway, I’ve reached the bottom edging on the cardigan. I’m intending to try picking up round the neckband this evening while watching the first Twilight film. I loved the books, so I’m hoping for a good adaptation. I’ve done my daily 4 rows on the Neck Down Wrap Cardigan. Nothing very interesting about that, either in the knitting or the talking about it. 4 inches of the 6 inches at the bottom of the cardigan now done. 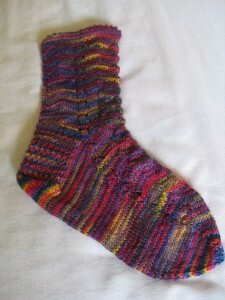 Yesterday I also cast on the second sock on my Pot Pourri Socks. First sock pictured left. These are lovely to knit, apart from the double figure of eight wraps which take a really long time. Every 7th row you can see the lovely flash of colour that the wraps give: worth it in the end. Listening to old episodes of the Fibre Beat podcast. I’ve been downloading this for a year or so, but never got round to listening to it before. So far, the episodes I’ve been listening to have concentrated on one issue in depth each episode – a nice contrast to the more magazine-like structure of my favourite podcast. Looking at what I’m knitting at the moment, you might be forgiven for thinking that knitting bores me and is a chore. Far from it, in the last few years I’ve found knitting to be more interesting than I ever thought possible. One of the reasons for writing here is to keep a note of all the new and interesting things I come across. Still, there is no getting away from the fact that I am currently on a drive to finish up old works in progress (WIPs) and there isn’t a whole lot that is thrilling about that. Welcome to the beginning of this blog. I’ve been thinking recently that I wanted somewhere to write about knitting in more detail than most of my Facebook friends might appreciate, and at greater length than Twitter allows. The result of this train of thought is this blog, so I hope you enjoy reading. A top-down raglan wrap cardigan. This is my first adult-sized sweater. I’m at quite a boring bit, so have a daily ration of at least four rows (they are quite long) before doing any other knitting. The second of a pair of socks is going to be cast on any day now. I knitted the first one in July and August before getting caught up in Sock Sniper and Tour de Sock, so I really ought to get back to it before too long. During night feeds (2 month old daughter) I’m catching up on old episodes of the podcast Cast On. I only started listening regularly at episode 92, so went back to the beginning and I’m now up to episode 64.